You can easily expand . * wildcard named port connections to explicit named port connections. Place the editor cursor either on a module or interface instance declaration and press Ctrl+1, select Expand . * port connections from the list of quick assist proposals and press Enter. The . * connections are expanded to named port connections. 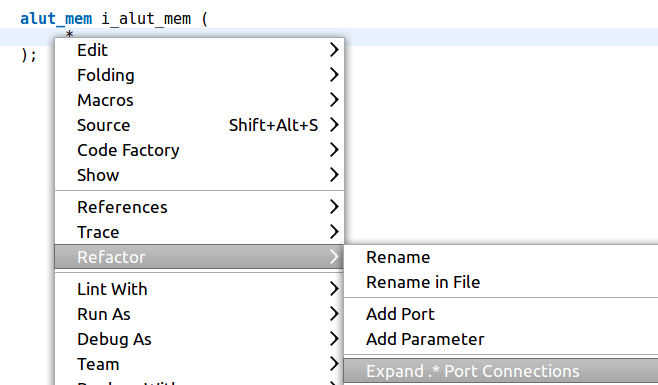 Note You can customize the look and feel of the explicit named port connections from Window > Preferences > DVT > SystemVerilog > Editor > Content Assist. Tip: You can also right-click in the editor and go to Refactor > Expand . * Port Connections.